Walmart is updating its ecommerce site in an effort to provide a more modern, personalized, and engaging customer experience. “Our goal is to make it compelling for customers to shop for whatever they are looking for,” said Marc Lore, president and CEO of Walmart U.S. ecommerce, in the company’s announcement. According to Walmart, changes will begin rolling out starting May 1, 2018. If you’re a Walmart supplier, here are five changes that could impact your product page strategy. 1. Images focus on products in use. “To bring a more human element to the site, we’re featuring relatable photography that showcases real-life moments,” said Lore in the statement. This new look and feel emphasizes visuals. Consider updating your images and rich media. There may be opportunities to integrate your best user-generated content to get at those ‘real-life moments. 2. Smaller number of products are featured on home page. Early screenshots show more white space and less real estate for products on the home page. The navigation bar is smaller and less prominent as well. This could mean your product’s rank and placement is more reliant on search relevance and sales rank. 3. Location plays a prominent role in what a shopper sees. Lore’s statement said, “the majority of the homepage will be personalized in some way. We’re introducing a new section that showcases top-selling items in a customer’s location.” Two of the three new modules on the homepage are location centric - “Trending Near You” and “Your Preferred Store.” Consider applying what you know about demand in your brick and mortar location when prioritizing, updating or customizing product information online. 4. Specialty shopping experiences will showcase products by category. In an effort to provide experiences tailored to each category, Lore said Walmart “launched a home specialty experience and, over the coming weeks, we will begin to introduce our new destination for fashion, which will feature relevant, bold imagery and seasonal stories.” Our advice is to use this insight to inform where you might focus efforts to add or update SKUs on Walmart.com. 5. Brands may get even more emphasis than before. “With these changes, brands will have opportunities to better tell their stories on Walmart.com,” Lore’s statement said. 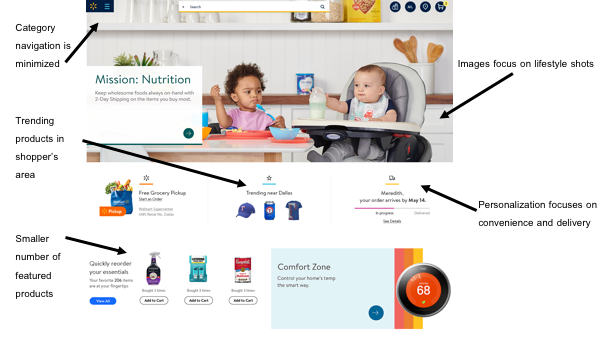 Walmart’s content strategy has centered on getting the best product assets directly from brands to speak to consumers. The product detail page designs have yet to be shared publicly, but given the emphasis on experience we expect the focus on brand content to continue or grow in importance. Salsify has worked closely with Walmart since 2015 to enable ways for brands to build engaging product experiences as well as save time and effort through automation. Learn more about how leading brands have grown sales on Walmart.com with Salsify.